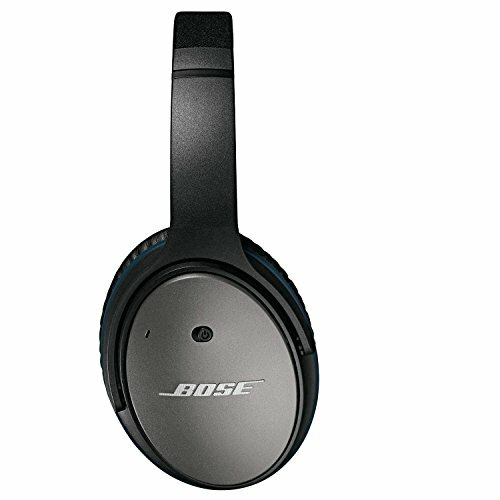 Bose QC25 vs QC35 II Noise Reduction Headphones: What’s the Difference? When you are traveling a lot, or just want a bit of peace and quiet, there is nothing better than a quality pair of noise-cancelling headphones. And let's face it, Bose has been leading the way with their Quiet Comfort headphones for years. I travel a lot on noisy trains and sometimes head home on long-haul flights to Australia, and that is when the QC25s from Bose are an absolute god-send. You can put them on, with or without sound/music playing and cancel out most of the surrounding noise in the blink of an eye. Other friends of mine also use them on their regular commute or trips on planes and could not live without them anymore. The Q25 has been the industry leader for years, but there were always a few things that it was missing. And, with the Q35 Bose has answered our prayers and added some great new features. Let's see how the Bose Q25 stacks up versus the Q35 and whether or not it is worth the extra money you have to fork out for the latest version! Audio 47.2 inches / USB 12"
Both these models produce great sound with top-end noise-cancelling capabilities, but there are some differences and details worth checking out. Fundamentally, the QC25 and QC35 models won't disappoint you as far as noise cancellation goes. However, the QC35 has upped the ante by taking this wireless. You can now enjoy your noise-cancelling environment without the annoyance of wires. You always have the option of connecting via a standard 3.5mm cable though, but given this is the main benefit of the Q35 (it's wireless) I can't imagine many of you will bother, unless the battery goes flat. Then you have to. There is also slightly less battery life when going wireless, with only 20hrs. But you get a bit more than the QC25 which has 35hrs when using the cable - 40 hours to be exact. You also get the option of changing the noise cancelling mode on the QC35. You can change it to either on or off, or reduce the level of cancellation if you want to be a little more environment aware. 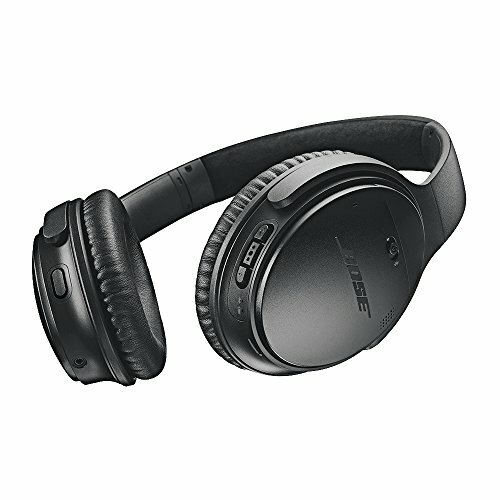 This can can be done via the Bose Connect App or via a button on the bottom of the left ear cup, if you are not using the Assistant (which otherwise needs this button). The other cool thing about the QC35 range is that you can connect either via Bluetooth (4.1) or NFC (if you phone accepts it). And, it does not matter what model phone you use. With the QC25 you had to choose the model that suits your phone (iPhone model or Android model) to get the most out of the headphones. If you are a keen Google Assistant user, the upgrade of the QC35 to the QC35ii might just be worth your while. Now you can receive voice notifications directly from your phone. How they arrive is up to you: prompted via the left ear-cup button with either a reduction in volume or pause. Quite a few of the reviewers on Amazon are raving about this feature and how it takes Google Assistant and multi-tasking to the next level. There are actually some noticeable differences in these things on the QC25 vs QC35 too. The overall shape of the headphones have changed on the QC35. It's now nearly half an inch shorter, sitting more easily on top of your head with a comfy foam padding. They are now a little wider, at 6.7 inches (from 6.1 on the QC25). But the biggest difference is the thicker ear cups (3.2 inches vs 0.9) which is mostly due to the integrated battery and extra buttons and microphone (no longer on the cable). That also means a little extra weight, with the QC35 weighing in at nearly 20% more than the QC25 - 8.3oz vs 6.9oz. So yeah, it's changed a little, but you have to expect that with the adaptions made for the new wireless goodness you get! Bose has streamlined the style of the QC35 offering a very simple selection of all black or all silver. The QC25 in comparison had three colors, the all black, the silver and white/tan both with nice light blue accenting inside the ear cups. In my opinion, the newer QC35 is not as nice looking, but the difference is not that big, except for the loss of the white mode. So, now the big question is: is it worth upgrading from the QC25 to the QC35 or even the QC35ii with Google Assistant? Who Should Buy The QC25? If you are not fussed about wireless or the ability to integrate well with Google Assistant, you can certainly get away with saving a few hundred bucks and going with the Bose Quiet Comfort 25. They are around the 150 mark on Amazon, compared to over 300 for the Q35s. Not only is the price significantly cheaper, but the battery life is a little longer and there is less fuss with pairing and other wireless shenanigans. Not that it is hard to get working, but a cable is just simple, right? Who Is The Q35 For? Personally, I am starting to warm to the whole "wireless headphones" thing. After all, having to deal with a cable when you have multiple layers of clothing (winter anyone?) or while on a plane or train is just plain painful. And although wireless cuts the battery life down a lot, 20hrs is still plenty of days commuting or home listening before you have to recharge. Not that big a deal when you think your phone needs constant attention! What about the Q5i vs Q35ii (Google Assistant)? If you have a device that allows for this and you have started to get into the whole "google assistant" vibe, then I totally recommend it.